One thing that amazes me about astronomy is that even after, what, 30 years of doing it (I was really young when I started) I still get surprised at some basic facts. That picture above is the spiral galaxy M101, a staple of amateur observing. It’s a big, bright, face-on spiral, and since it’s in Ursa Major (near the Big Dipper) it’s up most of the year. I’ve seen it a few times myself, though usually when I’m looking in books. Actually, in a lot of those books, it’s claimed that our own Galaxy would look like M101 if you could get outside of it. But boy, is that ever wrong! M101 is a lot bigger than the Milky Way. A lot. It’s 170,000 light years across, compared to 100,000 for us. 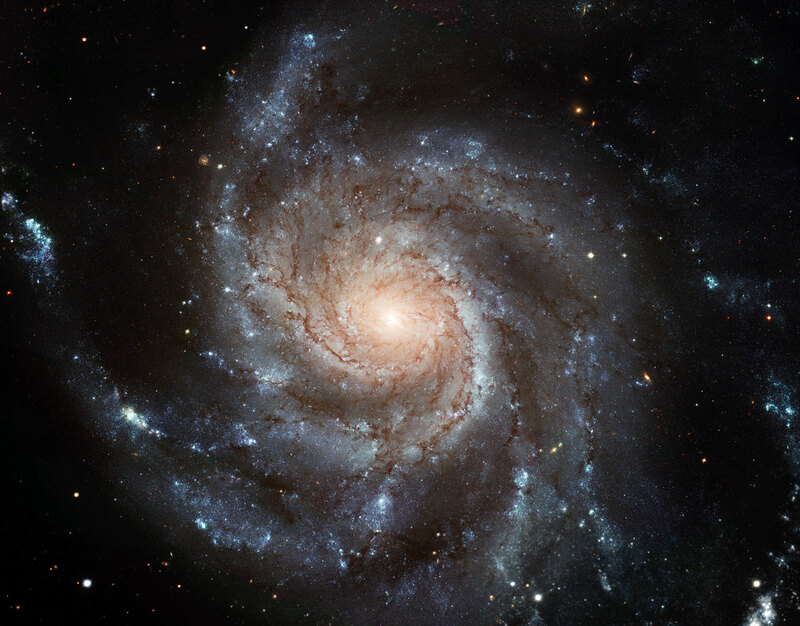 We have an impressive 100 billion stars in the Milky Way, but M101 is bursting with something like a trillion stars, ten times the number in the Milky Way! That’s staggering. I had no clue M101 was so huge. The picture above is a stunning new release from Hubble (click it for a higher-res version). It’s almost as awesome as the galaxy itself: the original image is 12,000 x 16,000 pixels in size, making it one of the largest images of a spiral galaxy ever produced. The images span nearly a decade and were originally taken for several different projects (it was nice to see the name of my old friend Kip Kuntz as the head of one of those projects; he assisted me way back when on my very first trip to Baltimore to work on Hubble data for my PhD). It took 54 separate Hubble pointing to span the face of this galaxy. If you have the stomach (and the broadband) for it, you can download the 455 megabyte full-resolution version, but you’d have to be insane. On my monitor, it would be ten screens in width and 20 in height! And the image on the right is a background galaxy (just above and to the left of the center of M101) that is probably something like 20 or more times farther away than M101’s 25 million light year distance. Spirals are generally blue, but no doubt this one is significantly reddened by dust in M101, like a sunset is reddened by dust suspended in air. Ironically, that galaxy is probably more like our Milky Way: it has a rectangular bar across the center, just like our Galaxy does. A bar like that is due to complicated gravitational interactions in the centers of galaxies, and for some reason M101 doesn’t have one. That’s interesting all by itself. I could go on and on. The image is incredibly rich in detail! So find yourself a resolution you’re comfortable with, sit back, and skim across the surface of this magnificent galaxy. With a trillion stars, and billions of solar masses of gas and dust, there’s enough there for everyone to enjoy.